As it is almost Halloween I decided this was the perfect moment to finally read Masking for Trouble. 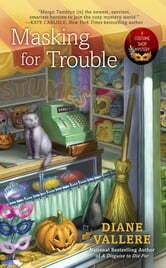 Masking for Trouble is the second book in the Costume Shop Mystery series and it takes place around Halloween. I really enjoyed the first book in this series and while this was a great sequel, in my opinion book 1 was better. What I enjoyed about this book was the focus on the costumes, the costume shop and the Halloween feel. The author really focuses on the costume thing and with the timing around Halloween that was even more prominent. I enjoyed reading about the different costumes and it really brings me in the mood for Halloween. For the most part if was an enjoyable read, it was well written and I easily got into the story. What I enjoyed less about this book was the mystery and the romance. The mystery started off well, with a dead body and the main character being the main suspect. Sadly after that it felt like it progressed very slowly. I also had trouble keeping two side character separate for some reason. While the book progressed I had no idea who the murder was, I did enjoy the book, but for a long time it felt like the mystery didn't go anywhere. And the police didn't seem to do much other than interview our main character a few times. My main issue with the mystery was the murderer. It was a good surprise and I didn't predict who the murderer was, but that's also the issue I had as looking back I was unable to find many if any hints toward this person being the murderer. It just felt a bit off as there were no well placed hints about who the murderer was. I also felt like at the end there were some things that could've been wrapped up a bit more. There were a few plot lines that could've been explained/ tied to the murder a bit more at the end in my opinion as now I was left with some questions. I liked the main character of this book. She's a bit quirky, dressing in costume every day and has her strong points and flaws as well. She is a bit too curious for her own good and gets involved into another murder mystery because of that. I also liked her bond with her father and their dynamic. And I liked we got to see more of familiar side characters as well. In my review for the first book in this series I remarked how for a chance I actually found a cozy mystery were I liked the romance. Well this book completely turned that around. Margo turned into a doubting mess and the romance was filled with miscommunication, lack of communication and secrets. And there was a lame attempt to turn it into a love triangle. At the end of the book I feel like most of the things got resolved luckily and we got one sweet scene involving the two of them. But for the main part of the book the romance really bothered me. To summarize: This is a fun cozy mystery set around Halloween. I really enjoyed the focus on the costumes, the costume shop and the Halloween touches. Main character Margo is fun to read about with how she is a bit quirky and dresses in costume, I also liked how it felt pretty natural how she got involved in the mystery. Sadly the mystery didn't quite work for me, I felt like the mystery didn't progress forward a lot, until the end. I hadn't figured out who the murderer was, so that was good. But it felt like there weren't enough hints to point to this person, so that felt a bit off. I didn't care for the romance in this book. I really liked Tak and Margo in book 1, but this book was full with miscommunication, lack of communication and secrets. I do hope the romance will be better in book 3 as most of it got resolved by the end of the book. All in all it was a fun Halloween themed read. 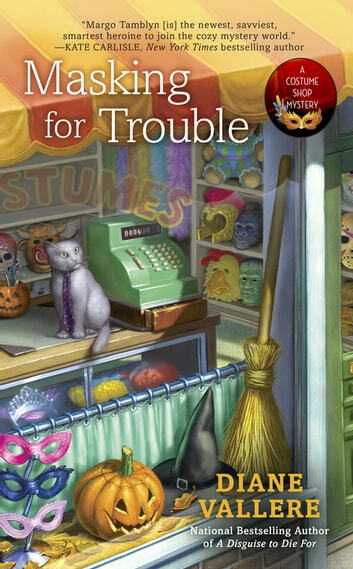 Masking for Trouble by Diane Vallere is the second book in A Costume Shop Mystery. Margo Tamblyn has been running Disguise DeLimit (on her own) for the last six months. Her father, Jerry is now traveling around the country looking for unique items for their inventory (something he has always wanted to do). Things are going well for the Margo and the shop until Paul Haverford comes into the store one afternoon (previous notices had been sent and they are currently sitting on the desk in the office). Paul has been buying up properties all over Proper City, Nevada. He is going to create Havetown with his businesses being to the go-to places for tourists. He is starting with the annual Halloween kickoff party. It is being held at the Alexandria Hotel this year and costumes from Disguise DeLimit are not eligible to win (you had to buy your costume from his cheap costume shop, Candy Girls—you know those costumes that come in a bag made of polyester and plastic). Margo attends the party anyway and ends up finding the dead body of Paul Haverford when she goes looking for water (she ended in an isolated area away from the party). Detective Nancy Nichols puts Margo at the top of the suspect list. Margo starts looking in to the case immediately (she wants off the suspect list). Margo must find time for her investigation while working in the store (which is very busy during the last few days leading up to Halloween) and dating Tak Hoshiyama (while not letting anyone catch on that they are dating). Will Margo be able to bag the killer before Halloween? Masking for Trouble has a clever concept. I like the costume shop angle and a town that loves costumes (and parties). I found the mystery to be simple to solve. I was able to figure out the killer just based on the character’s introduction in the book. You could also see how Margo was setting herself up to be the lead suspect. Margo is supposed to be savvy and smart, but she does not come across that way in the book. She pokes around the crime scene (after being told to stay away), and she gets herself into the victim’s office (and gets caught). I know she is trying to prove her innocence, but she ended up looking guilty (she came across as a busy body). Margo comes across as insecure, jealous, and annoying (sorry, but she got on my nerves toward the end of the book). Margo should stick to her costumes. I do like that she wears a different unique costume each day. I give Masking for Trouble 3 out of 5 stars. The book is nicely written and easy to read (can be finished in about three hours or less of solid reading). One thing I did find entertaining was the Kirby and the swim team. They are helping at Disguise DeLimit during the Halloween rush. Their group costumes were hilarious and ingenious. When I first started the book, I was liking it. But the further I delved into the novel, the less I enjoyed it. I believe it was just too over-the-top. What is wrong with good characters and a nice, complex mystery. I also thought that there was too much romance in the book. I prefer cozy mysteries that have a subtle romance where it builds up over the course of the series. The relationship (if you can call it that) between Margo and Tak Hoshiyama is over complicated (she has to fake a flat tire just to meet him). They are keeping it a secret because of Tak’s father. But then Margo gets jealous if Tak is seen with another woman (it was silly). Margo is also jealous (disturbed) and upset because her father is dating (he is entitled to a life of his own). While Masking for Trouble is the second book in the series, it can be read alone. The events from the first book are brought up in Masking for Trouble. Will I read the next book in A Costume Shop Mystery? I will give the next book a chance. I did not have the opportunity to read A Disguise to Die For (first book in A Costume Shop Mystery series) so this was my first foray into the series, and I could have just had an off day. I have read and enjoyed other novels by Diane Vallere.